Rosetta Stone. Ik Kom Uit de Verenigde Staten. When I tell people I’m learning Dutch, the most common reaction is “why?” I won’t have any trouble finding people who speak English in the Netherlands. And Dutch isn’t one of the more common international languages. But I’ll be living there. So out of respect alone, it makes sense for me to speak at least some basic Dutch, or Nederlands, as they would say. My wonderfully generous and supportive mother sponsored my education by shipping me levels 1 and 2 of Rosetta Stone. I had no clear expectations. But I figured with diligent study, I would land comfortably somewhere between fluent and bumbling idiot. And that should be sufficient to at least save face when visiting the bank or ordering some frites. 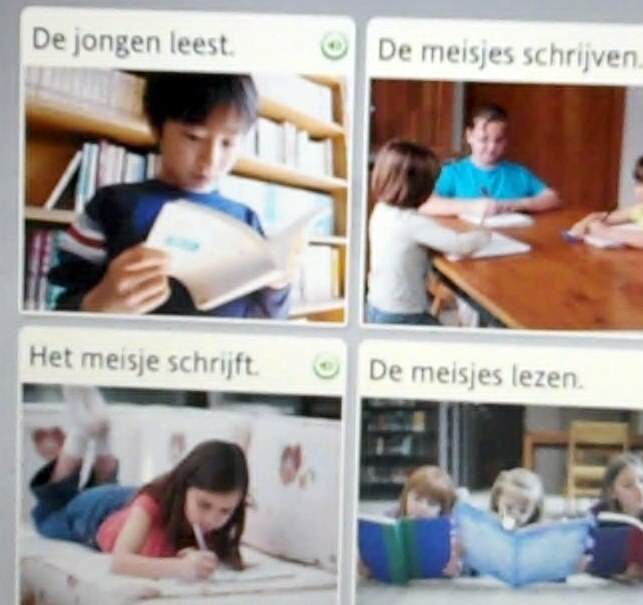 Rosetta Stone lessons are broken into levels, then units (like greetings and shopping), then lessons. Then each lesson is followed by 5 to 10 activities. So level 1 consists of 4 units. And within each unit, I must go through about 4 lessons and all of the accompanying activities before moving to the next. Activities cover vocabulary, pronunciation, reading, and writing. At the end of each one, having covered so much content, I feel smart, accomplished, and bilingual. Too bad I can’t seem to remember anything whenever someone asks me to tell them what I’ve learned so far. But I promise I get mostly 90% and above on all of my courses…really, I do. Each Rosetta session begins with putting on a fashionable headset, consisting of earphones and a microphone. It lets me know where I left off, and occasionally requires me to take a refresher course if I’ve been away for awhile or if I’ve simply reached a milestone date. But usually it’s just a matter of picking up where I left off. Viewing an image of a woman greeting a man at a door (or some variety of the sort), I’m required to say, “Hallo!” Then viewing a young child being greeted by his parents, again I must say, “Hallo!” Each lesson is guided only by photos – remarkable photos I must say. Beautiful, charming, and diverse photos of people, animals, food, and locations, all providing images that can be described in the most basic sentences, like “the computer is on the table” (de computer zit op de tafel) or “the mother reads in the living room” (de moeder leest in de woonkamer). But since no translation is ever provided, sometimes trial and error must be used when learning new words. For example, they showed me numerous pictures of families. But they were accompanied by different words: “gezin” and “familie.” Hm. What the heck is the difference? So using my savvy reasoning skills, I had to figure out the difference between the images. Turns out the “familie” is an extended family, including grandparents, aunts, uncles, and whomever else. The “gezin” is an immediate family, including only children and parents. So when I see “het gezin eet in hun huis,” I know that it’s the immediate family eating in their house. It’s funny. In English, a family is just a family. I wonder if they make other distinctions, like families with no father or families with two mothers. Does every scenario get its own word? Probably not. But that would be interesting. The writing exercises can be a challenges. Although much of Dutch sounds like uncivilized English, like “da man drink water (grunt).” The spelling of words is usually quite different. Well, except for “man.” That’s still just “man.” But extra letters seem to appear for no reason. And since the pronunciation is so different, I can’t simply sound things out…at least not yet. Speaking of pronunciation, ugh. This is not one of the sexier languages – that’s for sure. Harsh sounding and phlegm-filled, Dutch words certainly don’t just roll off the tongue. If I want to say the (immediate) family has green shoes (het gezin heeft groene schoenen), I’ll sound like one of those guys on the subway platform who spend their days hocking up loogies (is that an English word?). It’s disgusting, hard on the vocal chords, and just plain difficult. I find myself pausing and stumbling each time I came across a word that begins with “g” or otherwise requires me to start from a place deep in my throat I never knew I had. I traveled to the Niederlande several times per flying machine in the late late 90’s and up until 2003. The most I learned about the language was during an extended stay when an ex coworker (German Girl) got married to a Dutchman. Coming from the German language side, understanding was incredibly easy, and I found great similarities in what was said in a mix between English & German. However, the more I understood, the faster they spoke. You will have a ton of fun and I hope you get to travel a bit. Don’t call any of them “Cheese Head” (Kaes- Kopp), and yes, they drive fast, but not on the wrong side of the road.